I am very grateful for the renewed confidence which has been accorded to me, both by the convention and by the National [Union] League. I am not insensible at all to the personal compliment there is in this; yet I do not allow myself to believe that any but a small portion of it is to be appropriated as a personal compliment. The convention and the nation, I am assured, are alike animated by a higher view of the interests of the country for the present and the great future, and that part I am entitled to appropriate as a compliment is only that part which I may lay hold of as being the opinion of the convention and of the League, that I am not entirely unworthy to be instructed with the place I have occupied for the last three years. I have not permitted myself, gentlemen, to conclude that I am the best man in the country; but I am reminded, in this connection, of a story of an old Dutch farmer, who remarked to a companion once that "it was not best to swap horses when crossing streams." ^ a b c Murphy, D.F. reporter (7 Jun 1864). "Presidential election, 1864: proceedings of the National union convention held in Baltimore, Md., June 7th and 8th, 1864". Republican National Convention (3rd : 1864 : Baltimore, Md.). 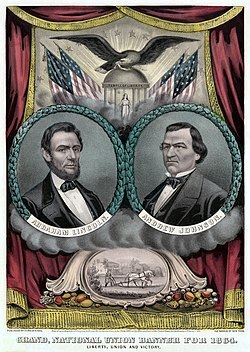 ^ a b "HarpWeek: Explore History - 1864: Lincoln v. McClellan". Retrieved 2010-05-31. ^ "Republican Party Platform of 1864". The American Presidency Project. 7 Jun 1864. ^ "Online Books by D.F. Murphy (Murphy, D. F. (Dennis Francis))". University of Pennsylvania. ^ Abraham Lincoln (June 27, 1864). "Letter Accepting the Presidential Nomination". Gerhard Peters and John T. Woolley, The American Presidency Project. Retrieved April 12, 2016.